You are here: Home › Products › Italian Syrup Artisan Peaches – Pesche sciroppate. These peaches are an outstanding product made in small batches at the fruit grower laboratory. 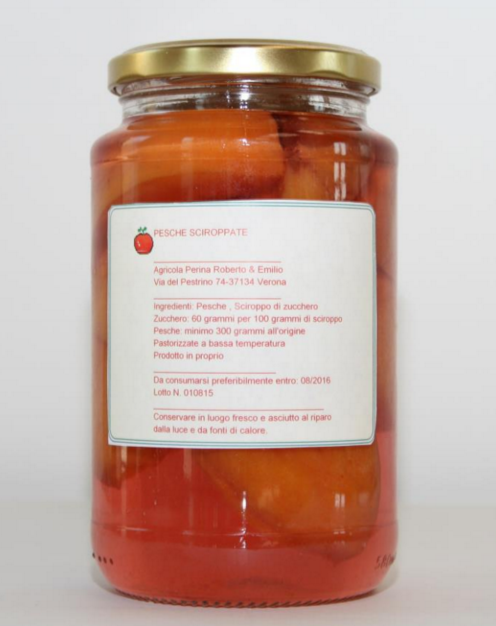 Pesche sciroppate are a classic and traditional fruit preserve that can be enjoyed on its own or as past of cooking. The slices can be incorporated in baking or as topping for desserts, ice creams and tarts. The producer is also a fruit grower based in Verona. So the peaches do not travel at all to be transformed indicating a good process for high quality. The fruits are then washed, cut in slices or quarters and cooked in a syrup of sugar and their own juices. Very fragrant, fresh, and crunchy slices. We created a delicious tart with this product, please see here the example. This producer is looking for wholesale opportunities in the UK, USA, Japan, Canada and Hong Kong. 1 review for Italian Syrup Artisan Peaches – Pesche sciroppate. Great product especially if used for high end patisserie. The slices are crunchy and fragrant. Highly recommended.